Are you Planning a Uganda Birding Safari...? 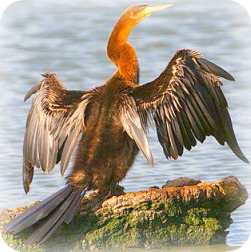 Then get ready to find the African Darter. The information about African Darters in this section of the Uganda Birding Safari guide will help get the most out of your Bird watching tour to Africa. The darters are black-brown water birds also referred to as the "snake bird” because of their habit of swimming with just their slender necks visible above the water. They are mostly found in inland waters like lakes and rivers with fringing vegetation. In Uganda, you will be able to see them on Lake Victoria and the western parts of the country in Lake Edward & Lake George. It is around 79-80cm in height. They are large with a long thin neck, smaller heads, dagger like- bills and large tail. The adult male bird is slightly larger than the female one. It has a thin white stripe from below the eye to down sides of the neck and a rufous foreneck otherwise it is blackish – brown above with fine white streaks on the wings coverts. The female is more brown with a less distinct neck strips. The immature bird does not have the neck stripes and is less brown in color. They often fly showing a distinctive silhouette. You will find these birds either single or in pairs. Building bulky nests made up of twigs and reeds usually in a tree. They make colonies with cormorants & herons. They are endowed with a unique fishing technique spearing the fish with their sharp dagger-like bills; it flips its prey up in the air, catches it and swallows its head first.